Our ATV Wheel Spacers will extend your rim and tire outwards from the hub, giving you more clearance for oversize tires, and will give your ATV more stability. These ATV Wheel Spacers come complete with all hardware, ready to bolt on and use! Select from Aluminum ATV Wheel Spacers or Graphite ATV Wheel Spacers. Tires-n-Stuff stocks ATV Wheel Spacers for Honda, Yamaha, Suzuki, Kawasaki, Polaris, Arctic Cat, and Bombardier! American made ATV Wheel Spacers. CNC machined from aircraft grade aluminum, not cast like most competitors wheel spacers. Comes in sets of two (fronts or rears). Featuring Dorman wheel studs (DOT automotive quality wheel studs). Does not require removal of your wheel studs. 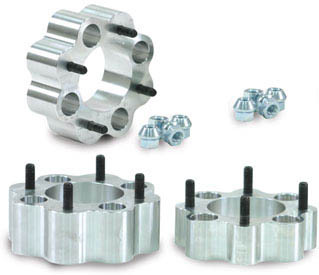 Lug Nuts and Studs are included with Aluminum ATV wheel spacers.